This is the second of 2 parts for our 5th Anniversary of Let's Voltron: The Official Voltron Podcast, which includes 5 special surprise guests from the Voltron Universe! During each guest segment, we give away 1 of the 5 total prizes in our #LetsVoltron5 contest! So, there are 2 prizes given away in Part 2! Make sure you listen to Part 1 of the 5th Anniversary Podcast before Part 2! Joaquim Dos Santos and Lauren Montgomery joined us for our 5th Anniversary Podcast, and we were so happy they could join us! They were the Executive Producers of Voltron Legendary Defender for 4 years! After completing the 78-episode contract with Studio Mir, DreamWorks Animation, and Netflix, Joaquim and Lauren will be putting their Director hats on in the Spider-Verse. Joaquim has been tapped to direct the sequel of Spider-Man: Into the Spider-Verse. David Callaham is writing. Lauren will be directing an untitled Spider-centric project that will gather the female heroes in the Spider-Man universe of characters in one adventure. Bek Smith will pen the script. Are anyone's spider senses tingling yet? We wish Joaquim and Lauren the very best on their new projects, but we do expect we'll get to talk to them on a podcast early in 2019, so we can reflect on Voltron Legendary Defender - The Entire Series! In this podcast, we give away the last 2 of the 5 major Voltron prizes for our 5th Anniversary! Our 5th Anniversary Podcast didn't only come with 2 great podcast episodes. It also came with a really cool bunch of designs from 5 amazing Voltron fan artists! In this Part 2 podcast, we introduce the artists for this 5th Anniversary Podcast, and we are proud to share these designs with you here, AND let you know you can buy these on our TeePublic store! We are so proud of the work that our "5th Anniversary Five" artists did on these designs, so please make sure you listen to this Part 2 of the 5th Anniversary Podcast to hear how this wonderful collaboration came together like Voltron! We hope you can reach out to these artists and thank them for all their contributions to Let's Voltron Podcast and to the whole Voltron fandom! Follow them and check out their awesome talent, and maybe commission them to make something special for you! Marc's gift to the fans was announced in this podcast, too! Marc created an Alexa Skill called #LetsVoltron and shared it on this 5th Anniversary Podcast. 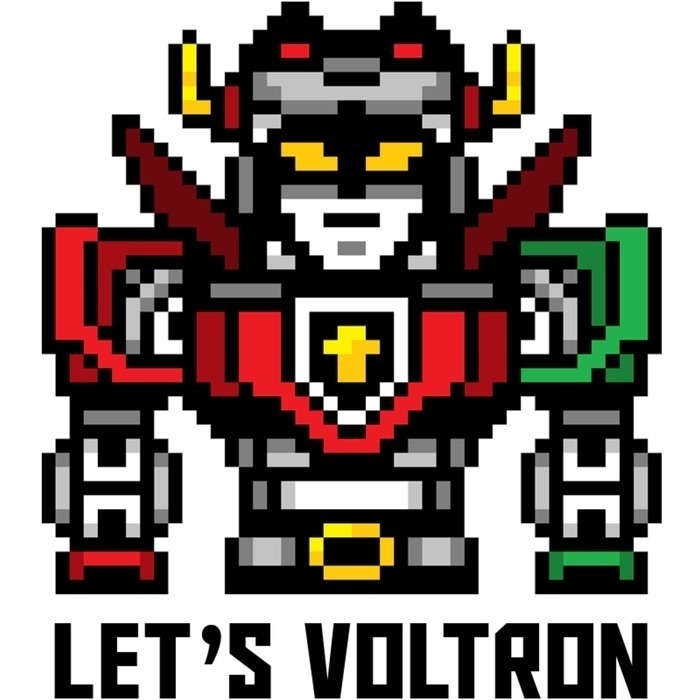 Enable the skill on your Alexa App and say, “Alexa, Open Let’s Voltron”. Every time you say it, you’ll get a random #Voltron quote! It would take hours to listen to all of the quotes, or you can just say it every time you get near Alexa on your Amazon Dot, Echo, Spot, Show, or an Alexa-enabled speaker! Please listen and feel free to share your thoughts about this 2-Part 5th Anniversary on social media with everyone! 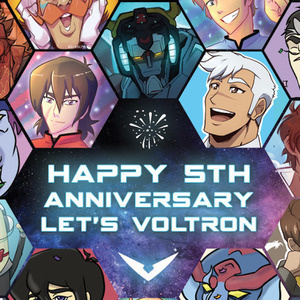 We also want to thank Susan C. for sending us your thoughts about your favorite moments on Let's Voltron Podcast and for sending us this really great 5th Anniversary picture! You rock, Susan! Thanks!